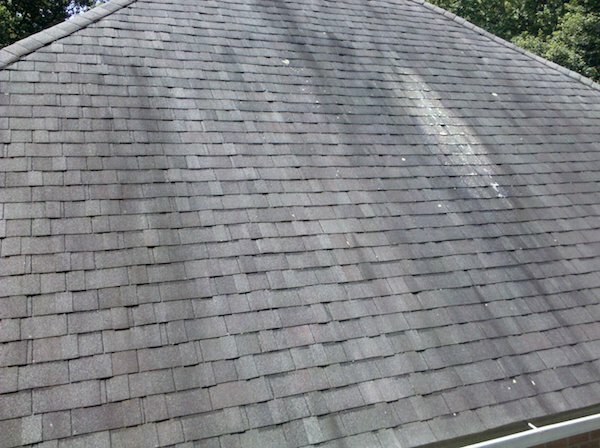 Have you ever noticed black streaks streaming down your roof or a green mossy growth? Both organisms are forms of roof mold or algae grown in humid areas. The black streaks, a form of algae known as gloeocapsa magma or roof mold, only appear in the most humid areas of the country. Therefore, it’s normal for the streaks to appear on the roof’s north side. This side of the roof receives the least amount of sun and stays damp the longest. The bacteria accumulated over time feed on limestone filler and moisture. The algae spores grow and darken, creating the dark streaks visible on roofs. These airborne spores can be carried from roof to roof and infest an entire neighborhood if left untreated. Not only do the elements and creatures carry the bacteria particles from place to place, the particles foster the growth of other roof inhabitants. The black stains harbor a number of molds or fungi which require warm, humid environments. The fungi lack chlorophyll, giving the them the name of heterotrophs. They feed on organic matter since they cannot manufacture food from raw materials. On the northern side of an asphalt roof gathers the most moisture, which raises the humidity and provides an abundance of organic nutrients for the fungi to feed off of. Another factor in supplying food sources to the fungi is the tar used in roofing. The substance is ultimately fossilized, dead organic matter. However, the granule base of asphalt is consumed first along with the tar. The dislodged bases accelerate deterioration of the roof because it cannot prevent the effects of excessive heat or extreme weather. For the removal of algae, there are a few options which can save the appearance and durability of your roof. Algae stains can be removed with the mixture of household bleach and water. With this method, you spray wash the roof with a mixture of water and bleach to kill the bacteria. Pressure washers are not advised because of the damage they can do to the shingles. Before washing your roof, be sure to wet down any foundation plants with water. Rinsing everything around the house’s foundation with water protects them from being affected by the bleach. Simply wash them down with clean water afterwards to prevent long-term effects. Applying a bleach or chlorine-based solution with gentler methods kills moderate algae, moss, and fungus growth almost instantly. For those against using straight household bleach, oxygen bleach is another alterative in eliminating algae stains. Oxygen bleach uses hydrogen peroxide versus sodium hypochlorite as an oxidizer. The result comes in liquid or powdered form for an eco-friendlier choice. Once mixed with water, the power or liquid eliminates all foreign specimens without taking the color out of your shingles. In addition, it doesn’t affect the vegetation surrounding your home. Using a pump sprayer, spray the solution on the roof continuously for 10 or 15 minutes. The oxygen bleach attacks the roof algae directly and begins to take the stains away. After the allotted time, take a scrub brush and lightly scrub the shingles. Apply more solution while you work for a deeper clean and hose off the roof once finished. If needed, repeat the previous steps until the stains are gone. The black mold-like stains appear on light-colored asphalt roofs. To prevent growth, install a 6-inch-wide strip of zinc or copper under a row of shingling closes to the roof peak. With an inch or so still exposed to weather, the metal molecules will run down the roof during a storm and kill any algae trying to colonize in your shingles. Shingles laced with copper granules will have this affect as well. Other options include using bleach mixtures as described above and replacing the problem areas with new shingles dark enough to disguise the staining. Algae and mold streaks affect the overall curb appearance of your home. But lowering curb appeal for outsiders isn’t the only problem caused by the black streaks. If you believe there is something more than algae streaking your roof, contact E3 Roofing & Remodeling to make an inspection appointment.